It’s a year since I started down the road looking at sawn timber retail prices in Australia. Part of the reason is the lack of publically available market-based stumpage prices for blackwood. What I have found is blackwood timber pricing that is all over the place. Here’s a summary of the four timber price lists I have found so far. Here we have Select grade blackwood selling for the same price as Radiata pine at Bunnings Hardware, and with no price premium for larger dimension timber. I hate to think what the grower of this blackwood got paid for their logs! Blackwood doesn’t have a future at these prices. This price list looks much better. It even has a modest 5.8% price premium for sizes above 25mm. And with the recent 15% price increase we are beginning to rival global premium timber prices. 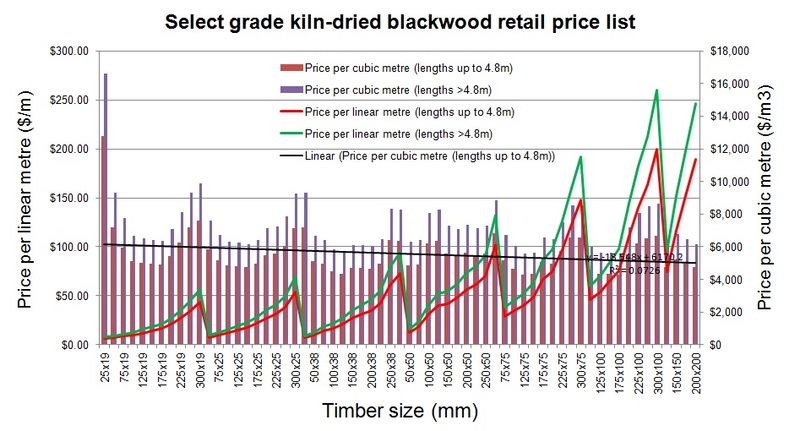 If this was the standard retail price for Select grade blackwood we might get some investor interest. This price list seems very confused. It offers a price premium for both small and large dimension timber (width), but this premium decreases with increasing timber thickness!? A huge ranges of sizes are offered, in two length classes. However these prices equate to Select Grade Tas Oak prices at Bunning. These prices are not those for a premium timber species. Yet another road to blackwood ruin. And finally we have retail prices for Hydrowood blackwood, which are much cheaper than Tas Oak at Bunnings. Bargain basement salvage blackwood timber designed to destroy the blackwood industry. In summary we have kiln dried select grade blackwood timber available from $2,500 to over $8,500 per cubic metre, with most price lists setting no price premium for larger dimension timber. In one case there is a negative premium for large dimension timber! With so much taxpayer-subsidised blackwood in the marketplace it’s impossible to know what the real market price for blackwood timber is. It is certainly not a growers market, and if growers can’t make any money then blackwood doesn’t have much of a future. The only basis for a successful forest industry is profitable tree growing. This is what happens when Government and industry policy dictates that the forest industry must be a community service and not a business. It’s time for another blackwood timber market price review, this time courtesy of Hydrowood and Uptons. My previous price list reviews have generally not named the suppliers, but in this instance I think I need too since Hydrowood is likely to be the major supplier of premium grade blackwood timber for the next 5 to 10+ years. Hydrowood will therefore set the price ceiling for quite some time. These prices are for rough-sawn, kiln-dried blackwood timber. It’s a curious price list for a number of reasons. Firstly there are only two grades of Hydrowood blackwood – fiddleback and everything else! The price for select (clear) grade is the same as for natural (knotty& defective)!! 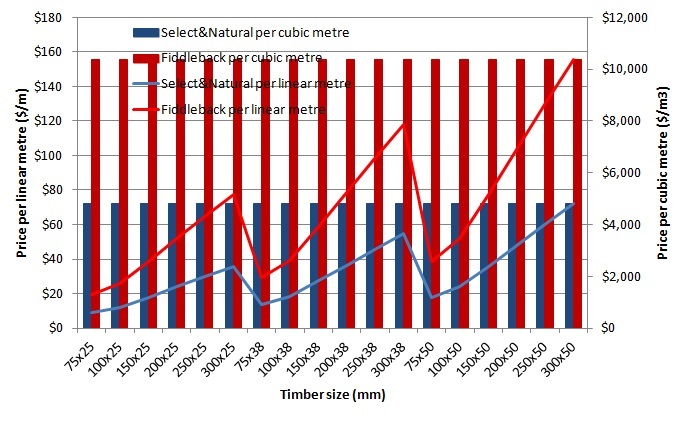 The other curious feature (and I’ve discussed this in relation to other timber price lists) is the lack of price increase (per cubic metre) with increasing piece size. Whilst you can cut large trees into small pieces of wood the reverse is not true. You can only cut large dimension timber from bigger, older trees. And bigger, older trees cost more time and money to grow. Therefore larger dimension timber should attract a higher per cubic metre price to reflect the higher cost to the grower. Of course there isn’t a “grower” in this case, but given that the owner of this resource (the Tasmanian Government) isn’t charging any royalties, and Hydrowood are a dominant supplier in the blackwood market, this creates significant pricing distortions in the marketplace. But there’s the thing. These prices bear no relationship to the cost of growing the wood. This is salvage timber from the bottom of hydro lakes. No forest management costs, no roading costs, no expensive forest practices plans, no royalties paid to the Government! This is low cost blackwood. In that regard it shares much with Forestry Tasmania the other major producer of blackwood. Forestry Tasmania produces blackwood at below cost and receives a direct taxpayer subsidy for doing so. If we want to encourage and develop a profitable sustainable forest industry then this isn’t the way to do it! This blackwood is even cheaper than Select grade Tas Oak at Bunnings!! The other interesting feature of the Hydrowood price list is that there are only three pricing structures for all of their species/products, of which two are shown in the above chart. The Natural/Select Blackwood pricing is shared with plain Myrtle, or what Hydrowood calls Western Beech (Nothofagus cunninghamii), and Tas Oak (Eucalyptus sp.)!! The fiddleback blackwood pricing structure is shared with Black Heart Sassafras (Atherosperma moschatum), Huon pine (Lagarostrobos franklinii), Marine-grade Celery Top Pine (Phyllocladus aspleniifolius), and flame-grain Myrtle/Western Beech. An intermediate pricing of $5,900 per cubic metre is applied to all Knotty Celery Top pine and plain coloured Sassafras. Of course the impact of these pricing structures on the future of the other (non-blackwood) species is irrelevant. These other slow-growing species do not provide any investment opportunities. But farmers can invest in growing commercial blackwood provided that markets are working properly, and Government and industry policy is supportive. No chance of that here in Tasmania. 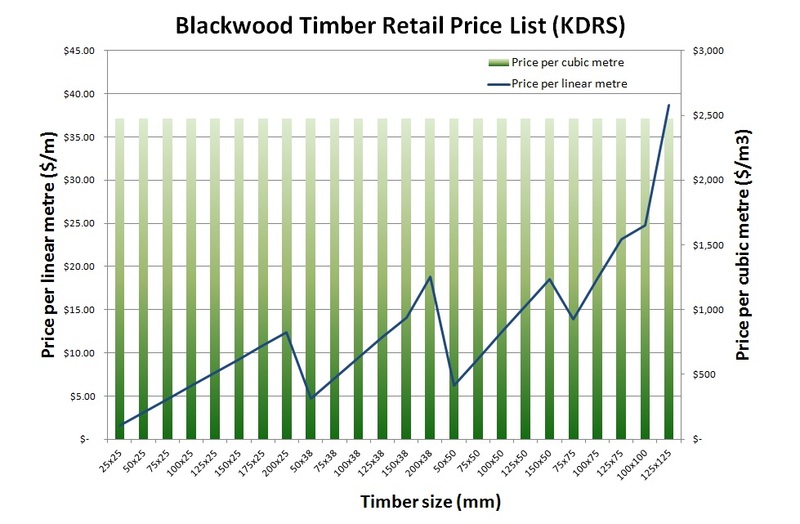 This is the fourth blackwood timber price list I have reviewed and what these price lists show is a blackwood marketplace in disarray. Blackwood prices are all over the place, from cheaper than radiata pine, to prices that rival the most expensive premium timbers in the world! If you were wondering whether to invest in growing commercial blackwood then this marketplace would not provide you with any confidence. I wish I could say that these prices clearly demonstrate the viability of growing commercial blackwood but I can’t. 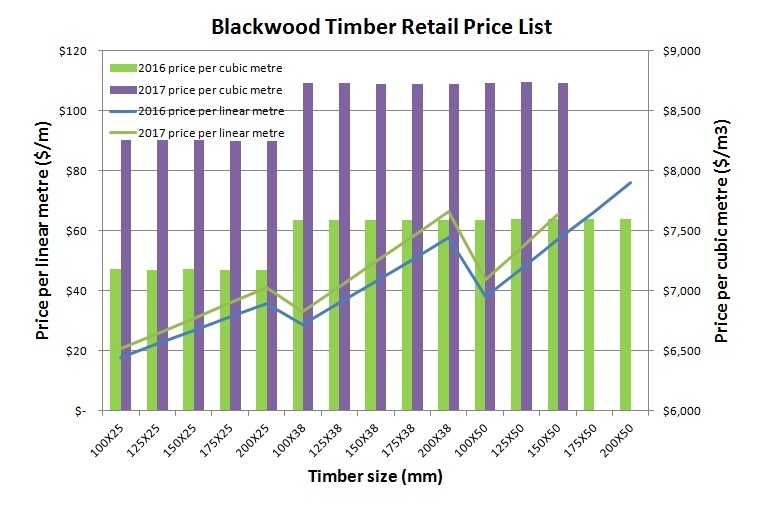 These blackwood timber price lists do not reflect the cost of growing the wood. Nor do they reflect an industry that has a vision for its future. Instead they remind me more of a closing down sale! They reflect an industry that has lost hope, and is now in a desperate race to the bottom. Without a solid commercial foundation the forest industry doesn’t have a future. So now you know where to get your cheap premium blackwood timber. In the interests of greater market and price transparency in the forest industry here is my annual summary of blackwood log tender results from Island Specialty Timbers (IST) for the 2015-16 financial year. This is the only publically available competitive market price data for blackwood logs. Unfortunately IST does not produce any market reports or annual summaries of their sales or other activities, which is why I produce this report every year. During the year 15 lots were tendered across 9 separate tenders. These comprised 11 individual blackwood logs, and 4 log parcels totalling 70.4 cubic metres (100 logs at an average volume of 0.70 cubic metres per log). Total volume tendered was 91.1 cubic metres. This is less than 1% of all blackwood harvested from our public native forests. This volume compares with 32 and 20 cubic metres of blackwood logs tendered in 2015 and 2014 respectively. In addition to the IST tenders there were two tenders by Hydrowood during the year, run through IST, one of which included 16 premium blackwood logs totalling 21.4 cubic metres. For the IST tenders the best result for the year was a small (0.68 cubic metres) plain-grain blackwood log (show in the above picture) that sold for $850 per cubic metre. The worst result for the year was a 30 cubic metre parcel of 44 plain-grain logs that sold for a very low $100 per cubic metre. One highlight for the year was a very large blackwood log that measured 4.35 cubic metres, with a length of 7.5 metres and a large-end diameter of 98 cm! Unfortunately this log had spiral grain and was deeply fluted so the sale price was only $275 per cubic metre. Of the four parcels of logs tendered only 2 parcels sold totalling 34.6 cubic metres for an average price of $135.50 per cubic metre, average log volume of 0.72 cubic metres. These are small logs. The average volume of the Hydrowood blackwood logs that sold for $625 per cubic metre was 1.5 cubic metres. An average plantation grown blackwood sawlog contains 1.5 cubic metres. All up the IST tender results for 2015-16 are a mixed bag with indications of a soft market. This is indicated by the low prices for the figured grain logs, by the fact that half the volume put to tender failed to sell, and total blackwood tender sales revenue ($10,096) was 50% down on last year. The real stand out result for the year was the Hydrowood tender at $625 per cubic metre for a large parcel of good size plain-grain logs. Unfortunately the volume of IST blackwood tender material is too small and the quality too variable to allow meaningful market/price comparisons between years. Much of the material is of poor quality, or in the case of the log parcels, the logs are of small size compared to what would be produced in a well managed blackwood plantation. Large volumes of large, good quality logs from blackwood plantations should generally command better prices than shown by the IST result. Wouldn’t it be great if this chart represented more meaningful data? So whilst an increasing (if still miniscule) volume of blackwood log is being put to public tender by IST, the volume of quality blackwood sawlog from public native forest continues to decline. Half of the volume of special timbers now harvested from public native forest in Tasmania constitutes “non-millable” material in order to make up the politically correct headline figure. Despite the fact that blackwood comprises over 80% of the volume of special timbers harvested from Tasmania’s public native forests, it comprises only 15% of the volume put to tender by IST. The blackwood market desperately needs more tradability, more transparency and much more commercial credibility. Island Specialty Timbers (IST) is an enterprise of Forestry Tasmania established in 1992 to increase the recovery, availability and value of specialty timbers from harvesting activities in State forests. Forestry Tasmania manages its special timbers operations (including IST) as a taxpayer-funded, non-commercial, non-profit, community service. Last year each cubic metre of blackwood log harvested by Forestry Tasmania received a taxpayer subsidy of $82! No private blackwood grower received any taxpayer subsidy. Note that all logs and wood sold by IST (excluding the Hydrowood logs) come from the harvesting of public native old-growth forest and rainforest certified under AFS (PEFC). It is unlikely that this tiny set of market-based blackwood log prices is representative of the broader blackwood market. The dataset is too small and variable in quality to allow any analysis or correlations to be made between price and log quality apart from the obvious result that feature-grain logs attract a significant price premium over plain-grain. Remember also these tender prices are effectively mill door prices that already include harvesting and transport costs. They are not stumpage prices. So whilst Forestry Tasmania, the State government and the State parliament all regard the special timbers industry as a taxpayer-funded community service and political play-thing rather than a commercial opportunity, then blackwood’s commercial future remains difficult. “The lack of price transparency for forest products, particularly from hardwood forests/plantations [in Australia], represents an impediment to the uptake of farm forestry. Unlike other commodities, price information for forest products is not published through the newspaper or accessible online. Better price transparency is required to encourage smallscale investment in trees” (p. 71. FWPA Report PN: PNA243-1112/2, 2013). This quote from a recent forest industry report says it all. Even the forest industry recognises price transparency is a major issue, but then does nothing about it. One of the authors of this report was none other than the recently appointed Director of Forestry Tasmania. Does this mean we will see greater transparency and competition at FT? When will Tasmania get a fully commercial, profitable forest industry, based on profitable tree-growing? Here are some more great pictures of Hydrowood blackwood going over the saw. It almost looks like rosewood rather than blackwood. The next Hydrowood auction is late January 2016. Tasmanian blackwood sawlogs at $625 per cubic metre! Ring the bells! Break out the champagne!! The first Hydrowood tender results were much better than I was expecting. The 17.7 cubic metres (13 logs) of plain grain blackwood logs sold for an average of $625 per cubic metre mill door. These were large good quality logs equivalent in size and quality to what can be grown in a well managed blackwood plantation. The 3 feature grain blackwood logs sold for $547 per cubic metre. So that’s $13,100 for one truck load (21.4 cubic metres) of blackwood logs. At $625 per cubic metre a mature blackwood plantation has a mill door value of $180,000 per hectare! Why aren’t Tasmanian farmers interested? Why isn’t the TFGA interested? Why isn’t the Government supporting this obvious commercial opportunity? The standout feature of this tender was the price paid for good quality celery top pine logs at $2,846 per cubic metre. This price far exceeds any price that Island Specialty Timbers have achieved for Celery logs. The results of this first Hydrowood tender clearly demonstrate that the market is prepared to pay very good prices for high quality special timbers logs. All up the 35 cubic metres (38 logs) of high quality logs at this first Hydrowood tender fetched over $30,000!! Congratulations to the Hydrowood team! The Hydrowood tender results are going to show the lies and deceit of State forest policy as expressed at the recent LC scrutiny committee meeting. The Government and Forestry Tasmania say that growing special timbers can never be a profitable commercial business because the market can’t afford to pay good prices! That the special timbers industry is a community service and has nothing to do with commercial opportunities. No one is going to invest in planting Celery top pine, Huon pine, Myrtle or Sassafras for wood production. These species are just too slow growing. Blackwood however is fast growing and can be grown successfully in commercial plantations. Research in Australia and New Zealand has proven that speed of growth does not negatively impact on wood quality in Tasmanian blackwood. A second tender of Hydrowood logs and milled logs will commence in late January. To discover more about this innovative venture go to http://www.hydrowood.com.au. Now who is interested in creating and supporting a profitable sustainable future for our special timbers industry? The first 38 lots of Hydrowood logs and sawn timber are now open for public tender. The sawn material is whole logs sawn into 50mm slabs. A total of 35.4 cubic metres of timber and logs are for sale of which 21.4 cubic metres (60%) are blackwood. Two of the blackwood logs are milled into 50mm slabs. Blackwood logs range in size from 0.4 to a massive 3.03 cubic metres. The Three of the 16 blackwood logs are noted as having feature grain. This is a significant parcel of blackwood logs to go to public tender. This is the first of what is expected to be 80,000 cubic metres of special timbers to be salvaged over the next 3 years. This is far more special timbers than has ever been supplied to market before. Most of this volume will be blackwood. It is far more wood than the domestic market can accommodate. It will take some time before mainland and international buyers become aware of these sales and become involved. So I’m not expecting a great result from these first few tenders. This material is available for viewing at Wynwood Sawmill, about 7 km from Wynyard. I’m happy to promote these sales for a number of reasons, and look forward to seeing greater volumes, competition, and demand and price transparency in the special timbers market. Hopefully demand and price will keep pace with supply. by email to murray.jessup@forestrytas.com.au by 11 pm. hand delivered to: Forestry Tasmania, 79 Melville St, Hobart, by cob, 5 pm. mailed to: ‘SFM Hydrowood Tender’, Forestry Tasmania, Box 207, Hobart, TAS, 7001. Reserve prices apply to material in this tender sale, negotiations with bidders will occur if an offer is within 10 % of the reserve price.